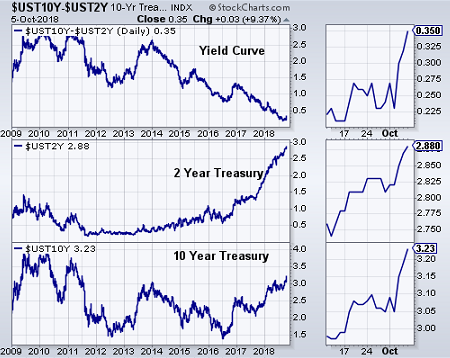 Following are several article links containing perspective on rising interest rates and the potential positive and negative implications for equities. The negativity around interest rates along with the mostly positive economic data, seems to be generating some investor concern around stocks. Although the S&P 500 Index and the Dow Jones Industrial Average Index are down only 1.5% and 1.4%, respectively, from their highs, some sentiment data is positioned expecting further downside in equities. One measure worth watching is the CBOE Equity Put/Call Ratio. At Friday's close, the Equity Put/Call Ratio reached .84. The equity P/C ratio tends to measure the sentiment of the individual investor by dividing put volume by call volume. 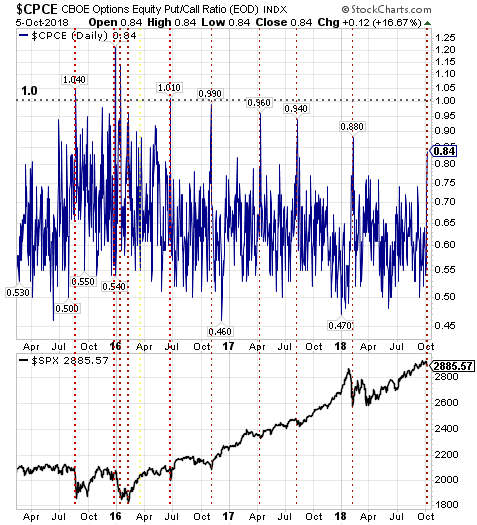 At the extremes, this particular measure is a contrarian one; hence, P/C ratios above 1.0 signal overly bearish sentiment from the individual investor. Although the ratio is below 1.0, it's rise is an indication of increasingly bearish investor sentiment. As noted in the Barron's article above, "Ed Hyman, Evercore ISI’s boss and Wall Street’s almost perennially top-rated economist, sees a bright side in the backup in bond yields. Stocks will “weaken a touch,” which should tamp down 'animal spirits' that might get too feisty, he contends. That, in turn, will stave off an overheating in the economy in a virtuous, self-correcting process."